This past Sunday I was on vacation visiting my younger daughter and her husband in South Carolina, so I got to attend a different church and hear a different pastor preach. I always enjoy this — seeing what other saints are doing and how they are thinking. The message was a good one, a reminder that as saints we can be hopeful. Many people today are fearful — they are afraid of their own death, and they are afraid that the world will end through some man-created catastrophe — global warming, nuclear war, an unstoppable plague etc.. These fears have always been around, and so far it hasn’t happened. The Bible actually tells us that although the world as we know it will come to an end, it’s not our job to predict or worry about how it will happen. When that day comes, it will be like a thief in the night — something we probably aren’t expecting at all. The Bible tells us that our bodies will be resurrected. We will be ourselves, but without the aches and pains, the sinful desires, the anxiety and depression that we experience now. We will be reunited, with Christian friends and family members who have gone before us. We will get a chance to meet some of the great cloud of witnesses–saints of the Bible or from history that we admire. What would you like to ask Martin Luther? or Mother Teresa? or the apostle Paul? The world itself will be restored to it’s pre-fall condition. I guess that means no disease, no destructive weather, no failed crops. The most beautiful scenery we have ever seen will be surpassed by the beauty of God’s world in that day. Finally, we’ll be rewarded by the continuing presence of our Lord. What could be better than that? As saints, we have nothing to fear. We can be hopeful. God will never leave us or forsake us. As she walks through many difficult circumstances she begins to call each one, The Lord Will Provide: and He does, although not always in the way she imagined. Katie brings to life many of my favorite Scriptures — the road to Emmaus, the resurrection of Lazarus, Mary of Bethany and more. 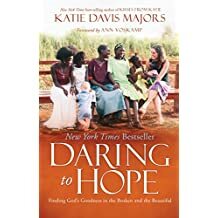 She learns to hope because “God Himself is our reward,” to see people through His eyes and to cope with the unwanted and unexpected consequences of life. I give it 5 stars and I’m sure I will be passing it on. It may show up in our Little Free Library of Leitersburg! I know that I’m guilty of living in my own world. Something is going on in my life and I pull all the sensors in, so to speak. I don’t look out into the world and see the pain and suffering that is out there. If I don’t see it, I can’t do anything about it. Not even pray. I’m centered on MY pain and suffering. When this song came out in 2010 I was starting to look out of my own little world. Starting to pray for others and ask how they were doing. Asking about that medical problem that’s worrying the family. Their problems that I knew about. I would start a prayer list and I would pray for them. It’s too easy to say that you’ll keep them in prayer and then forget. One thing that needs remedied in my own little world is shown in this video. I don’t DO something. Sometimes the only thing that you can do is pray but many times you can actually do something. Listen to this song by Matthew West. It reminds us that there is a larger world out there. The most recent issue of The Ambassador, our denomination’s magazine, contained an article by a pastor who remembered his grandfather, and all the things he had done for him and meant to him. One of the best things about being a Christian is, we believe the friends and loved ones we have lost through death are not lost to us forever. My grandfather is also one of the people I remember and know I will see again in Heaven. He is the person in my childhood who loved me, helped me go to college, and had confidence in my ability to do whatever I wanted to do in life. That’s a great gift, and one day I didn’t fully appreciate as a young person. I’ll be able to thank him for that one day. Then there are the two Christian women who joined our church. One was ill when she began attending, the other became ill shortly after. I know if circumstances had been different, we would have become fast friends. We would have worked hard for the Lord together. We would have spent joyful times in fellowship, if only we had had more time. One day we will have that time. Our friendship will blossom as it should have. There are so many things I now wish I had taken the time to ask older relatives about. What were there lives of my grandparents and great grandparents like? Who did they love? What did they like to do? I’ll still be able to ask those things some day (that is, if they are still important to me). The list could go on. The point is, life is not over for those who are in the Lord. We don’t have to have regrets about all the things we didn’t say or do with them or for them. Who wouldn’t want that comfort? Our sermon last Sunday was about giving thanks for our spiritual blessings. When we give thanks, we most often think of how God has provided for our material and emotional needs. Things like food, shelter, health, family and friends are definitely on our “thank you” list. But what about spiritual blessings? Too often we take them for granted, we forget that they are even greater gifts from God. So take a minute to read the first chapter of Ephesians, giving thanks for each of the spiritual blessings the apostle Paul enumerates.